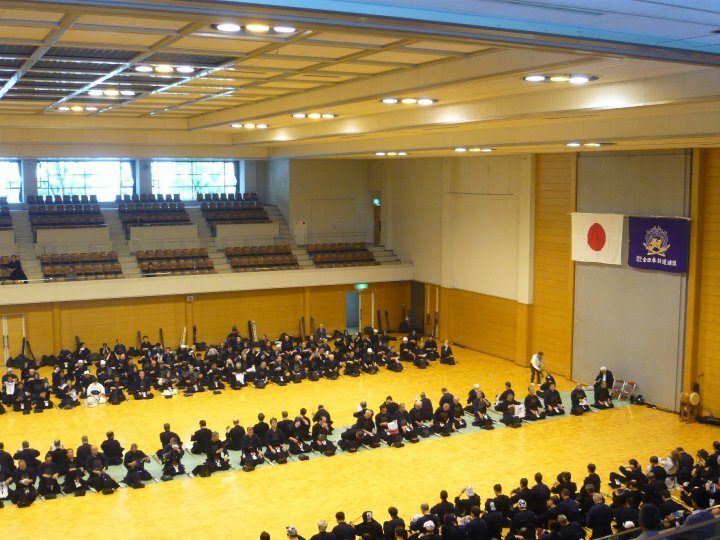 There seems to be a division of opinion between kendoka who are attracted by the ritual involved in kendo and those who feel that some of the ceremony is out of place in a modern martial art. Sonkyo is used only in sumo and kendo and whilst we don’t engage in salt throwing or have our referees dress in Heian period hakama and signal with gunbai, we are asked to pay a lot more attention to etiquette than our friends in judo or karate. I am aware that Kumdo in Korea does not use sonkyo, but as my only experience with Korean kenshi has been within the context of FIK kendo where they are gracious enough to use the Japanese system, I am not in a position to comment. Personally, I like the ritual aspect of kendo. I believe that the reiho of bowing correctly to the dojo, to kamiza, to sensei and to your opponent help prepare your mind for the intensely serious business of keiko. Mokuso before and after each practice is the time to change your mind-set from that of the working day. Sonkyo particularly aids the transition from not fighting to fighting. We start with an empty mind as we make the initial bow and make three steps forward. As we draw our shinai and drop into a squat we engage with our opponent. This is where we make mind contact. As a referee I can see when two shiasha have locked on to each other and are ready to start. This is the time to call hajime. 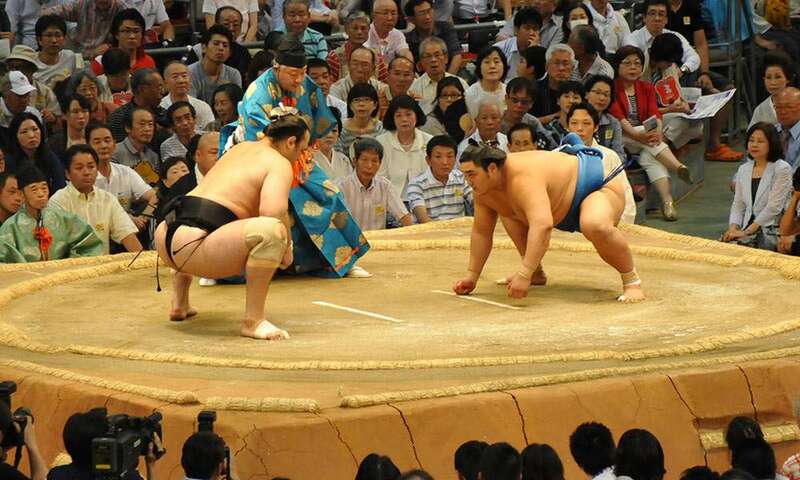 From my very limited knowledge of sumo, this also is what the referee is looking for, but it is even more evident amongst the salt throwing and false starts. 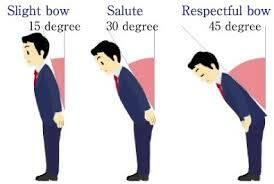 The down side of a complex etiquette framework is that we have to devote much of our training to learning not just when and where to bow but how to bow correctly. I mentioned in an earlier post that last year I had the privilege of a private kata lesson in Yoshino with Uegaki sensei, who has just gained Hanshi. Three quarters of the lesson were devoted to the correct way to enter the enbu-jo , take seiza and bow. Watching newer kenshi, it is easy to judge the length of their experience by their command of reiho. We all start with dropped chins and sticky-out bottoms when we bow and I defy anyone who has not done a considerable amount of keiko to produce anything other than wobbly sonkyo. The bad news is that when we get to the tail end of our kendo careers and knees wear out, sonkyo starts to get wobbly once more. I thought that I had written enough about reigi over the time I have been writing this blog, but a mixture of recent circumstances have drawn me back to the subject. A number of kendo teachers have mentioned to me that they felt the standard of reigi is slipping in the UK as it is in many other countries. I also officiated at the weekend at a taikai where quite a few of the shiaisha were unsure of the correct method to enter and leave the shiai-jo. This could be explained by the fact that they are comparatively new to kendo, but I think that if someone is qualified to enter a kendo competition, then their dojo instructor owes them a lesson in the way to behave in a shiai. People who have been reading my blog for a while will appreciate that my own outlook on kendo is very conservative. I suppose it is only to be expected as I spent much of the 1970’s training in Japan with a number of old-school sensei who continually stressed the importance of correct kendo etiquette. One of the proudest moments in my kendo career was when I was chosen to wash Matsumoto Toshio sensei’s back in the dojo bathhouse. Obviously the world is changing but I still believe that reigi and reiho (the way of demonstrating reigi) are what makes kendo a shugyo and not just a violent sport. I don’t believe that a lack of knowledge about kendo etiquette it is a purely western issue; I have met a number of young Japanese kenshi who have not learned to bow correctly and who do not know which leg goes first when they put on or take off a hakama. Like their British counterparts they are all nice people. They get on well with their friends in the dojo, they are thoughtful and courteous, but have not been taught all the elements of reiho. Reiho is something that instructors should stress as an integral part of kendo. New kendoka need to repeatedly practise bowing and sonkyo in the same way as correct cutting and footwork. They need to be taught the ways in which we show respect to our peers, juniors, seniors and those that went before them. In the same way that we learn good manners from our parents, we need to learn good kendo manners from our teachers. I appreciate that some dojo leaders have responsibility thrust upon them and do not necessarily know all the answers, but if they don’t there are books to consult and other sensei to ask. Presenting Fighting Spirit Prize to Mukhtar Hussain. 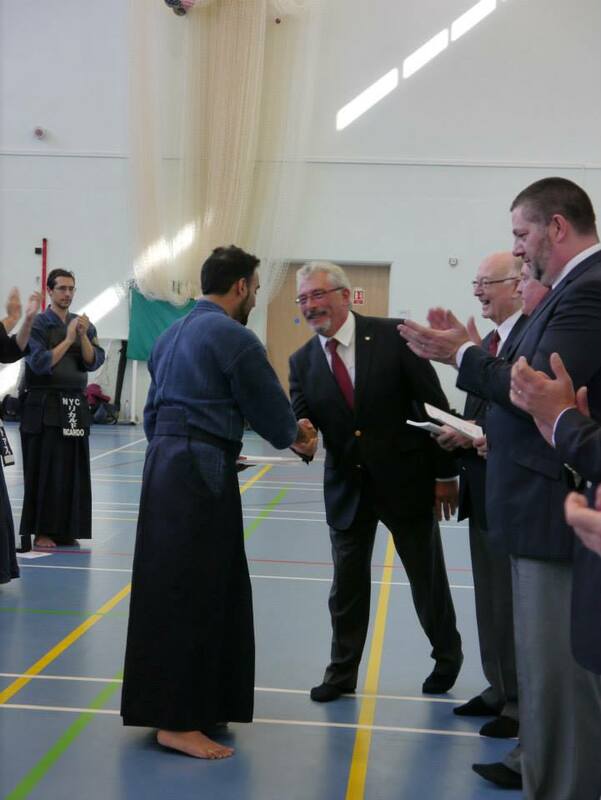 This year’s Sir Frank Bowden Taikai took place on Saturday. As shinpan-shunin one of my duties was to work with the refereeing team to select candidates for the fighting spirit prizes. Of course different referees have different opinions on who to choose, but this is not surprising as we all probably have different views as to what “fighting spirit” actually means. This is a subject that is seldom discussed and I can’t remember ever seeing objective guidelines as to what constitutes fighting spirit. Having asked colleagues the reasons for their choices over many years’ competitions, I get the feeling that definitions include the following. Being one of the most aggressive fighters. Overcoming the odds – small person beats much bigger person or low grade beats higher graded opponent or opponents. Turning things around – being in situations where you come from being a point behind to evening the score and taking one more point to win, or pulling out the stops in the captain’s match to take an evenly drawn team score to victory. Having the best technical kendo. Someone who in spite giving it their all in every fight still shows courtesy and fairness to their opponents. I believe that all of these are valid in their way, but I feel, and this is as subjective as it sounds, that true fighting spirit is a combination of all of these. Of course aggression is important, but it must be controlled and shown within a spirit of fair-play. The smaller or less experience player or the individual who overcomes the odds and snatches victory from the jaws of defeat will most likely, only be a contender if he or she uses correct technique. On the other hand correct technique will probably be admired, but not if you do not have the strength of mind and will to win to overcome your opponent. If you can do all this and at the same time show correct reiho and generosity of spirit to your opponents, it should do even more to enhance your chances of getting a fighting spirit prize. On a practical level, it is unlikely that you will get the first place medal and a fighting spirit award. It is generally thought that being the winner or being in the winning team is reward enough in itself. Despite the subjectivity, I was very confident that on Saturday we picked three worthy winners – Jenny Wilding, Mukhtar Hussain and Sarfraz Aziz. All fought consistently well throughout the day and displayed the true spirit of kendo.